Pluripotent stem cells (PSCs) are self-renewing stem cells with the ability to differentiate into all cell types of the embryo proper. They can give rise to all cell types derived from the germ layers ectoderm, mesoderm and endoderm, a property known as pluripotency. Their enormous developmental potential makes PSCs prime candidates for applications in regenerative medicine, where lineage-specific progeny cells are used to replace degenerated or diseased cells and tissues (PMID: 24434846). PSCs are also a powerful tool for studying human diseases and development. PSC differentiation in vitro can partially recapitulate human development in vivo. Comparing PSCs from healthy and diseased donors can provide insights into the pathology of human diseases and, in combination with modern genome editing techniques, opens the possibility of modeling disease-specific lesions. Finally, PSCs have opened new avenues for drug and toxicity screening (PMID: 23746976). Based on their origin, pluripotent stem cells can be classified as human embryonic stem (ES) cells or induced pluripotent stem (iPS) cells. Human embryonic stem cells are derived from the inner cell mass of a developing human embryo and were isolated for the first time in 1998 by James Thomson (PMID: 9804556). Use of ES cells is controversial because their derivation involves the destruction of a human embryo, and many countries have imposed restrictions on their de novo generation and use, such as the regulation of stem cell research in Europe. Induced pluripotent stem cells are derived from somatic cells via somatic cell reprogramming. Due to their somatic origin, their use is viewed as ethically less problematic. For details about reprogramming, see the section below: 4 Somatic cell reprogramming. Both cell types grow as cell lines that form characteristic adherent colonies. In terms of morphology, marker expression, developmental potential, and experimental handling, ES and iPS cells are essentially indistinguishable. Miltenyi Biotec has created dedicated application protocols to maintain and cryopreserve pluripotent stem cell lines. In 2006, Takahashi and Yamanaka reported the reprogramming of somatic cells to a pluripotent state using defined transcription factors (PMID: 16904174). iPS cells have since become an invaluable tool for strategies in basic developmental research, disease modeling, drug discovery, and regenerative medicine. Several methodologies have been developed for the de novo generation of iPS cells (PMID: 26883003). The webinar in the Related Resources panel to the right offers an overview of reprogramming methods. Miltenyi Biotec offers clinically relevant reprogramming tools for iPS cell generation based on non-integrative mRNA transfection technology. mRNA reprogramming has the highest efficiency among all current technologies (>1 %) and is the safest and fastest method for the de novo generation of iPS cell lines (PMID:25437882). Somatic cell types amenable to reprogramming with this technique include human fibroblasts, endothelial progenitors, and renal epithelial cells. Establishing high-quality cultures of proliferating fibroblasts is key to the success of reprogramming experiments. Use the Whole Skin Dissociation Kit, Human with the gentleMACS™ Octo Dissociator with Heaters to gently and efficiently dissociate human skin biopsies and generate fibroblast cultures from patient samples. Unlike traditional outgrowth cultures, starting with a single-cell suspension results in consistent monolayer cultures and yields enough fibroblasts for reprogramming within 5–8 days after plating, depending on biopsy size and cell number required for the planned reprogramming method. mRNA reprogramming technology outperforms other methods in conversion efficiency and kinetics and is a significant improvement for fast, safe and effective reprogramming of mature human cells. This method also eliminates the risk of genomic integration and mutagenesis inherent to DNA and virus-based technologies (PMID: 20888316,25437882). Magnetic cell separation offers an effective and fast means of isolating reprogrammed iPS cells to establish new iPS cell lines. Traditionally, iPS cells are isolated by picking individual colonies, which assumes that each colony represents a single reprogramming event and enables derivation of a clonal, genetically homogeneous cell population. Live cell staining antibodies for the pluripotency markers TRA-1-60 or TRA-1-81 can assist identifying and picking reprogrammed colonies, but this method is nonetheless labor-intensive and requires experience in identifying reprogrammed colonies and transferring them to a new culture dish. With magnetic cell separation, reprogrammed cells can be isolated in bulk (PMID: 23734247). Multiple cell lines can be processed simultaneously, generating large amounts of cells in a short time, and the process can be automated. Furthermore, bulk cells can be subjected to subcloning, if clonal cultures are required. For details on MACS® Cell Separation Technology, see the MACS Handbook chapter Magnetic Cell Separation. MACS Cell Separation Technology offers an easy way to purify reprogrammed iPS cells based on pluripotency markers such as TRA-1-60 or SSEA-4 (PMID: 21637193, 26281015). Alternatively, isolation can also be achieved by depleting unwanted fibroblasts (PMID: 26237226) using the Anti-Fibroblast MicroBeads, human. An article describing the magnetic isolation iPS cells after reprogramming can be downloaded from the Related Resources panel to the right. Propagation of pluripotent stem cells requires special attention and qualified reagents to maintain their pristine features. Different basic cultivation principles have been developed over time and have different advantages and disadvantages. A webinar describing the different cultivation systems for PSCs can be accessed from the Related Resources panel to the right. First approaches to human ES cell derivation were carried out in the presence of supportive feeder cells (PMID: 9804556), such as mitotically inactivated primary mouse embryonic fibroblasts (MEFs), as well as several fibroblast cell lines (NIH/3T3, STO). These cells support the growth of both mouse and human pluripotent stem cells through the secretion of cytokines and extracellular matrix molecules (PMID: 22760161,22099024). Optimal maintenance of pluripotency feeder-based cultures requires further supplementation with low amounts of human FGF-2 and human serum or serum replacement. Feeder cell coculture became the gold standard to work with human PSCs and is still widely used. However, feeder-based coculture requires separating PSCs from feeder cells prior to further analysis or experimentation. Strategies for the removal of feeder cells. (A) Mouse embryonic fibroblasts (MEFs) adhere more readily to uncoated tissue culture plates than PSC, enabling separation of the two cell types. (B) PSCs can be weaned off feeder cells over several passages. 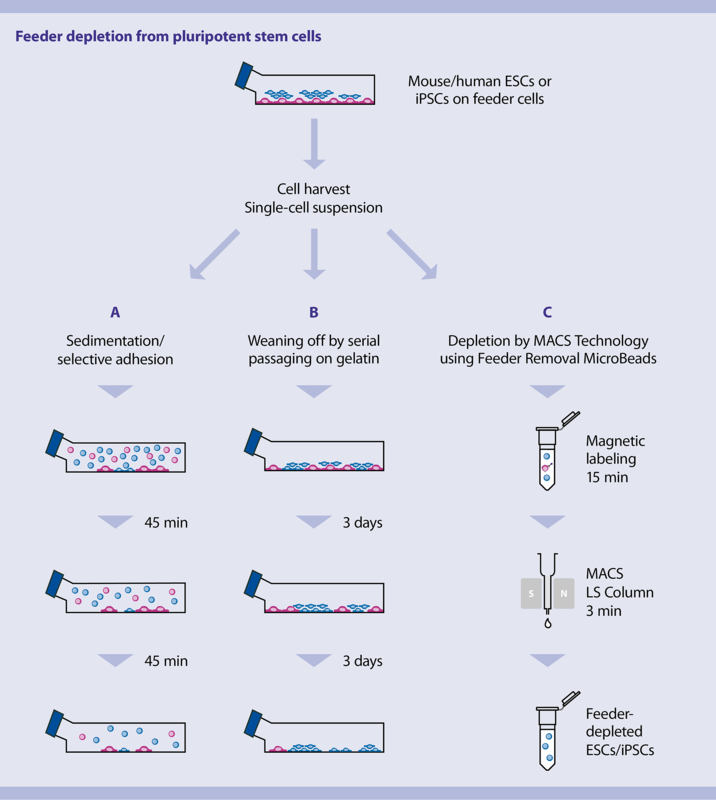 (C) Finally, feeder cells are easily and efficiently removed from single-cell suspensions using MACS Technology. Strategies for removal of feeder cells. The presence of feeder-cells can interfere with sensitive downstream applications, such as differentiation or gene expression profiling. Removal of feeder cells can be done by leveraging the preferential adherence of mouse embryonic fibroblasts (MEFs) to uncoated tissue culture plates, by weaning off the feeder cells over several passages, or by magnetic cell separation. The first two protocols are time-consuming, incomplete, and lead to considerable loss of pluripotent cells. The weaning method can also cause feeder-adapted PSCs to enter a crisis characterized by a high degree of spontaneous differentiation and impaired lineage differentiation. In contrast, MACS MicroBead Technology is a simple, yet efficient method for feeder cell removal. The Feeder Removal MicroBeads, mouse enable depletion of MEFs in 20 minutes. For removal of human feeder cells, Anti-Fibroblast MicroBeads, human are the tool of choice. Depletion of feeder cells by magnetic cell separation. Mouse embryonic fibroblasts (MEFs) were depleted from a coculture with mouse embryonic stem cells using Feeder Removal MicroBeads, mouse, an LS Column, and a MidiMACS™ Separator. Flow cytometric analysis with CD15 (SSEA-1)-APC and Anti-Feeder-PE on the MACSQuant® Analyzer indicates that a starting population of 10 % MEFs was completely removed. The purity of the enriched ES cells was about 99.9 %. As PSCs move closer to clinical applications, alternatives to coculture with feeder cells eliminate the qualification and risk assessment required for feeder cells as additional components of a culture system. The first culture system for feeder-free propagation of PSCs was described in 2006 (PMID: 16862139), and has since been refined by reducing the number of components (PMID: 21478862). Miltenyi Biotec developed a media formulation that combines robustness and reproducibility with a reduced number of components suitable for GMP-grade production. The research-grade StemMACS™ iPS-Brew XF and GMP-grade iPS-Brew GMP Medium enable a seamless transition from basic research to manufacturing for cell therapy applications. Feeder-free culture systems replace the feeder layer with a coating matrix that facilitates cell attachment. Various extracellular matrices are used, including Matrigel® and its derivatives, which have components of animal origin, and vitronectin or Laminin-521, which are recombinant, chemically defined matrices (PMID: 24463987). StemMACS iPS-Brew XF can be combined with any commonly used matrix, but Laminin-521 is recommended because it maintains the xeno-free culture system and provides superior attachment. Culture protocols initially called for daily media replacement. Especially with the first generation of feeder-free PSC culture media, any deviation from standard protocol could lead to increased spontaneous cell differentiation, slower growth rates, or down-regulation of pluripotency markers. Initial passages often looked fine, but changes became obvious during long-term culture with reduced feeding. Newer media formulations enable more flexibility in feeding schedules. This feature is frequently attributed to the substitution of native FGF-2 with thermostabilized versions of the growth factor. Our in-house data indicate, however, that the overall media composition and ability to provide a balanced and robust source of energy, nitrogen, amino acids and salts is at least if not more important in affording that flexibility. StemMACS iPS-Brew XF enables flexible feeding regimes, including the possibility of skipping one or two feeding days, and has been tested for maintenance of proliferation rate, pluripotent morphology and surface markers over 5 passages. Results of this analysis can be downloaded from the Related Resources panel to the right. Pluripotent stem cell lines cultured in StemMACS iPS-Brew XF have typical pluripotent morphology and surface phenotype. Different PSC lines have different growth kinetics. Therefore, the optimal time and ratio for passaging must be determined individually for each cell line. Generally, it is good practice to keep cultures in a subconfluent state, where colonies are visibly separated. Split cultures before reaching confluency to avoid fusion of colonies and a rapid drop of growth factor levels. A video showing various passaging techniques for PSC can be accessed from the Related Resources panel to the right. Detachment of human PSCs must be gentle to maintain maximum viability. StemMACS Passaging Solution XF is designed to minimize cell culture manipulation, eliminating lengthy inactivation, dilution and centrifugation steps. The ready-to-use formulation facilitates a reproducible and standardized splitting procedure. Human PSCs show decreased survival and attachment when colonies are dissociated into single cells or small cell clusters. ROCK inhibitors such as StemMACS Y-27632 or StemMACS Thiazovivin counter this effect and increase survival during passaging and thawing after cryopreservation (PMID: 17529971,20406903). Optimal storage of PSC lines is critical to maintaining a pool of stable lines, preserved at early passage number. 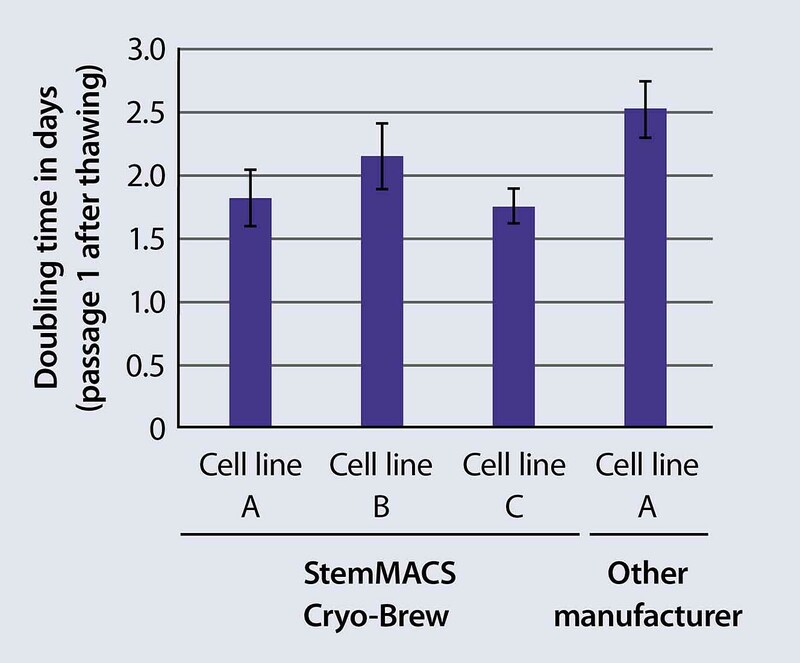 StemMACS Cryo-Brew is a chemically defined media formulation that preserves pluripotent stem cells with >90 % viability and enables rapid culture initiation after thawing. Adding a ROCK inhibitor to the culture medium after thawing guarantees optimal attachment and survival because cells recover as single cells or small cell clusters (see Splitting pluripotent stem cells cultures). Recovery and viability of cryopreserved human PSCs. 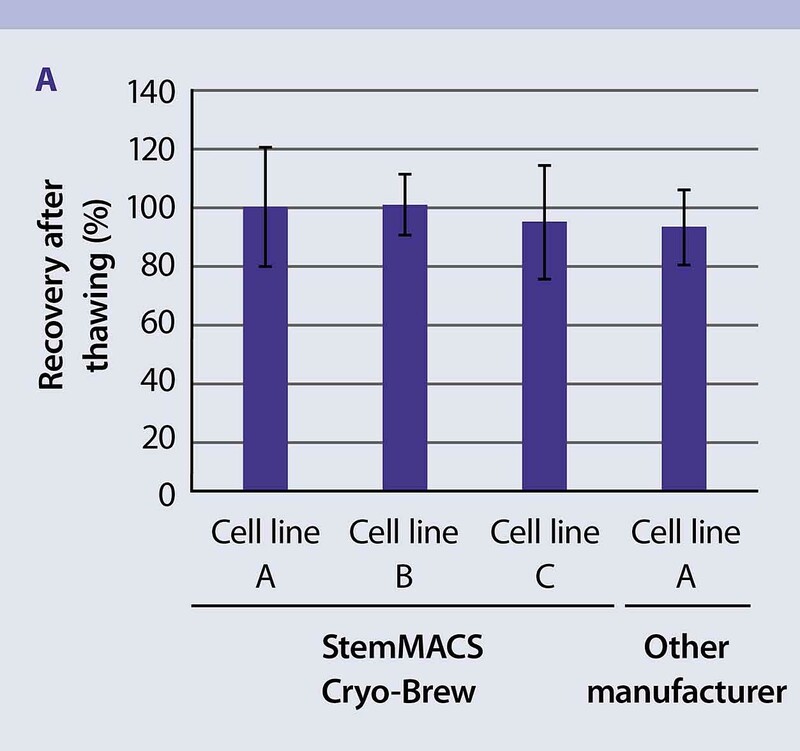 Cell recovery after thawing is high for PSCs cryopreserved in StemMACS Cryo-Brew. Recovery and viability of cryopreserved human PSCs. Exceptional is the short doubling time they exhibit, compared to cells preserved in conventional freezing medium. StemMACS Cryo-Brew is also suited for the storage of other cell types, including PSC-derived neural and cardiac progenitors, hematopoietic stem cells, mesenchymal stem cells, and T cells. A scientific poster on the efficiency of StemMACS Cryo-Brew in preserving various cell types can be downloaded from the Related Resources panel to the right. If cultured under suboptimal conditions (e.g., insufficient levels of FGF-2) or exposed to environmental stress (e.g., change of culture media or attachment matrix, overconfluent cultures), PSCs may undergo unwanted, spontaneous differentiation. MACS MicroBeads, such as the Anti-TRA-1-60 MicroBead Kit, human and the Anti-SSEA-4 MicroBeads, human, efficiently remove differentiated cells to generate a pure homogenous population of PSCs for subsequent culture or differentiation. Efficient separation of undifferentiated PSCs. Pluripotent (TRA-1-60+) iPSCs were isolated from cultures containing spontaneously differentiated iPSCs grown on mouse embryonic feeder cells using the Anti-TRA-1-60 MicroBeads, an MS Column, and a MiniMACS™ Separator. Cells were fluorescently stained with Anti-TRA-1-60-PE and Anti-Feeder-APC after separation and analyzed by flow cytometry using the MACSQuant Analyzer. Cell debris and dead cells were excluded from the analysis based on scatter signals and propidium iodide fluorescence. While magnetic separation may help overcome problems caused by temporarily suboptimal culture, it is essential to place the separated cells back into an appropriate culture environment. If the extent of spontaneous differentiation is high, purification should be repeated during the next split. Also note that some PSC lines show an inherently high tendency to spontaneously differentiate. If such lines must be maintained and cannot be discarded within the scope of a research project, immunomagnetic separation can be used to clean up cultures prior to downstream experiments. However, separation may not lead to homogenous long-term cultures in these cases. Human pluripotent stem cell lines can vary significantly with respect to their growth and differentiation characteristics. The genetic and epigenetic basis of this heterogeneity is still poorly understood and the subject of ongoing research (PMID: 23673969). Thorough and comprehensive characterization is therefore mandatory when establishing new ES or iPS cell lines and good practice during propagation of established lines. A typical base characterization includes assessment of morphology, extra- and intracellular marker expression, pluripotent differentiation potential, and karyotyping. In addition to pluripotency markers, antibodies that detect signs of early differentiation (e.g., Anti-SSEA-1 Antibodies) or the presence of feeder cells (e.g., Anti-Fibroblast or Anti-Feeder Antibodies) can complement the analysis. Especially with intracellular antigens, detection using conventional mono- or polyclonal antibodies has often been hampered by high background signals. Miltenyi Biotec REAfinity™ Recombinant Antibodies guarantee highly specific detection with low background signal. For details, see chapter Cell Analysis – Reagents. The pluripotency and differentiation status of PSC cultures can be monitored by immunofluorescence microscopy or flow cytometry. The latter allows quantitative evaluation of culture composition and comparison of different cell lines and data points. A detailed protocol for flow cytometric quality control of pluripotent stem cell cultures with up to 6 markers can be downloaded from the Related Resources panel to the right. Traditional assays to assess the differentiation potential of human PSCs include teratoma formation in mice and embryoid body formation in low attachment cell culture vessels. Both assays are time-consuming and difficult to reproduce and quantify. An alternative is directed differentiation into derivatives of the ectodermal, mesodermal and endodermal lineages. However, to enable the comparison of different cell lines, the same differentiation procedure must be used for all cultures, with highly reproducible protocols and reagents. Miltenyi Biotec has developed the StemMACS Trilineage Differentiation Kit, human, which provides standardized, ready-to-use media for differentiation into ectoderm, mesoderm, and endoderm in 7 days. Combined with flow cytometry analysis of the resulting differentiated cells, this kit enables a quantitative comparison of the pluripotency of different PSC lines. A scientific poster describing the quantitative assessment of PSC differentiation potential, as well as a detailed protocol for the analysis of differentiated samples by flow cytometry can be downloaded from the Related Resources panel to the right. When deprived of pluripotent growth factors, PSCs will undergo spontaneous differentiation and give rise to a mix of endodermal, ectodermal and mesodermal cell lineages to form embryoid bodies (EB). The Embryoid Body Dissocation Kit, human and mouse can be combined with the gentleMACS Dissociator to reproducibly dissociate these spheroids into single cells. The enzyme blend in the kit preserves the majority of surface epitopes, allowing reliable analysis or separation of the differentiated target cells from the resulting cell mixture. A variety of differentiation procedures have been developed to maximize yield of the desired differentiated target cells. The following is an overview of differentiation protocols known to work with feeder-free iPSC cultures using StemMACS iPS-Brew XF. In addition to directed differentiation using small molecules and growth factors, mRNA transfection of critical transcription factors can be used to aid differentiation. A number of neuronal and adipocytic mRNAs are available for transfection of PSCs. MACS MicroBeads enable rapid isolation of cells of specific lineage at any time point during differentiation. Optimized kits are available for a number of PSC-derived cells, and if a particular cell type is not listed, use the MACS Marker Screen, human to screen and analyze 371 human markers and identify suitable ones to isolate cells of interest. MACS MicroBeads are also available for a wide range of indirect labeling strategies, such as the isolation of dopaminergic progenitors listed above.